I have used the search option and I have read many of the posts in advance. I will be in San Francisco for three full days 11-13 August with the wife and two teenage daughters (very understanding/tolerant for the most part). I understand that there is a huge music festival going on at the Presidio and that will impact us. This is our first time there and first and foremost is a little family vacation with me stopping them to take pictures of the sights along the way. We will not have a car and are thinking of doing a two day hop on hop off double decker bus tours and we are staying in the Union Square area. We do have tickets for the night tour of Alcatraz and I am very jazzed for that and have done a lot of research on things to see. I will be taking pictures of the family and whatever else catches my eye (iconic sites), again my family is very patient and will not mind me setting up a tripod here and there. I own Canon 5d mark4, 16-35 F4, 24-105 F4 & 70-200 F2.8/ 2 flashes/ small led panel & my lightest tripod is Mefoto Globetrotter, along with a plethora of other stuff. 5d mark4, 16-35 F4, 24-105 F4 & Mefoto Globetrotter, batteries/charger/clea​ning stuff mf towel/ND filters/ Rain bags/light, small Led light panel carried in a Lowepro Fastpack BP 250 AW II. I want to travel light and what would you bring lens wise, should I lug around the 70-200? I have searched all over the Alcatraz website and goggled and there is mention of people bringing tripods there, but nothing recently, anyone know if I can bring one? Any opinions on camera gear or San Francisco are greatly appreciated. I had the chance to visit Alcatraz during my last trip to San Francisco. I purchased the tickets in advanced via online (alcatraz bay cruises, the official website). You can buy the tickets up to 3 months in advanced. I bought the night tour ones, I think they are the BEST. They're a little more expensive but definitely worth. The night tours are at 5:55 or 6:30, and the last boat leaves Alcatraz around 9:20pm. I definitely recommend the night one, since you can visit the whole prison, and after a little while when the sun sets you have the most amazing view of the sunset and the city. I STRONGLY RECOMMEND BRINGING A TRIPOD!! That way you can take the most beautiful pictures without movement. About the tour, first they let you off the boat and start a mini tour guide around the premises, while going up a big ramp (it's kind of steep, you'll walk a lot here). Then they give you the audiotour, you have to line up in the shower room, it's very well kept, it starts your Alcatraz sensation right there. The audiotour is very good, since it merges narration and actual voices from inmates and guards. I specially liked the part where they tell you the story of the night some inmates tried to escape, since they guide you exactly the way it was, you actually believe you are at that moment. Finally, when the audiotour ends, you return the device and you can continue around the area, i strongly recommend going upstairs where the psych ward and the hospital wing were, It's very desolated and it definitely gives you the creeps! Overall, this is a must see experience." • Warm Layered Clothing, hat, gloves It is a lot colder and windier on Alcatraz than SF, and in summer months a dense cold fog often comes in thru the Golden Gate...dress in layers. Did I say, "Dress in layers!" • A wide-angle lens is indispensable in the tight cell-blocks. • A fish-eye lens will give you even more field of view to photograph inside a cell or create grossly distorted views. • A telephoto lens is necessary to shoot San Francisco. Image stabilization will be useful. • Charge your batteries and bring extra one or two, and an extra memory card. BTW, it can be deceptively slow to get across SF, which is about 7 mi. square. What appears to be a 20 min trip can be closer to 40 min. in reality. Your hotel location is near the green area on Geary (2 blocks west of Kearny) on the map, at the eastern side of SF (in the NE corner). Taxis to/from airport are OK, but other destinations within SF other than between Fisherman's Wharf and downtown are not so dependable to find. Caution depending upon taxis in SF...they are horrid for NOT coming even in response to phone requests if you are in the western half of SF trying to get back downtown...better luck using Uber or Lyft than using SF Yellow or Luxor if your origin/destination is outside the NE quarter of the city! You can use www.511.org to plan trips across city using bus/trolley/cable car/BART even to Marin County and Alameda County...enter origin intersection and destination landmark/intersection and timeframe, and it suggests bus routes to catch at what intersection. Ferry trips to Sausalito (Golden Gate Ferry) or to Tiburon (Blue & Gold Fleet) are nice scenic trips across the Bay from Fisherman's Wharf area, and both places are themselves nice small communities to spend some time in before returning to San Francisco. You can even easily travel by boat in one direction, and take mass transit for the other direction (about 1.25 - 1.5 hours). Route 66F in Marin connects Muir Woods to the Sausalito Ferry Pier. From early June to early August the shuttle runs seven days a week, and the rest of the warm months it runs only on weekends. Post edited over 1 year ago by steve67. Wow, thank you for the information. Agree with bringing layers. The San Francisco Bay Area is generally warm/hot in August, but the city itself can be very cold if it's foggy. The ocean temperature is in the 50s, so that really cools off the downtown area. If the wind is whipping through Alcatraz, it can really feel cold. If it's sunny and not too breezy in the city though, it could be in the 60s and 70s, so layers help. Check the forecast before you leave. If you stick to the immediate downtown area, you can get around reasonably well just by walking. It can be a hike because of the steep hills, but if you are up to it you'll see a lot more that way. Union Square is nice to walk around and China Town is worth checking out nearby. From Union Square, you have two options to get to Pier 39 and the Wharf. First is to take the trolly from the Powell station. You'll wait in line for awhile (avoid the lines by getting there early), but it's San Francisco's iconic mode of transportation. The second option is to take the F-line train. Catch it on Market Street and the train will head down Market to the Embarcadero, and then take the Embarcadero over to Pier 39. It's relatively quick and inexpensive ($1-2 I believe). Stopping for lunch at the Ferry Building is a nice option along the way. Coit Tower is a nice view point. It's at the top of a hill, so it's quite a hike up, but worth the view around sunset. From there the sun will set around the Golden Gate bridge, and the blue hour will give you some nice views back to downtown. There's always some kind of festival going on. Especially if it's at Golden Gate Park, that's far enough away that you probably won't notice any extra people. Golden Gate Park has a lot to explore, but can also take a long time to get to on public transportation and it's impossible to see in just a day. I would suggest checking the Golden Gate Park website to see if there is anything you want to visit there and maybe head over to that destination specifically. As far as lenses go, I'm not sure I would drag along the 70-200. It could give be useful when getting city shots from Alcatraz, or Golden Gate shots from Coit Tower, but I'm not sure you'll use it enough to be worth it. The 16-35 and 24-105 are good choices with your 5D4. Have a great time. San Francisco is one of my favorite cities. Cool, thank you for the all the information as well, I'm going to leave the 70-200 at home and travel as light as possible. From Union Square, you have two options to get to Pier 39 and the Wharf. First is to take the trolly from the Powell station. You'll wait in line for awhile (avoid the lines by getting there early), but it's San Francisco's iconic mode of transportation. The second option is to take the F-line train. Catch it on Market Street and the train will head down Market to the Embarcadero, and then take the Embarcadero over to Pier 39. It's relatively quick and inexpensive ($1-2 I believe). Stopping for lunch at the Ferry Building is a nice option along the way.. The iconic SF transportation is called the 'Cable Car', which is pulled along by an undertrack cable, it is not a 'trolly'...which could put you on a different vehicle if you asked a native for the 'trolly station' they might send to to an underground station in the downtown area under Market Street (trolleys emerge to surface tracks away from downtown). The Cable Car is relatively expensive (for public transportation) at $7 per person (age not relevant) because of its iconic status. 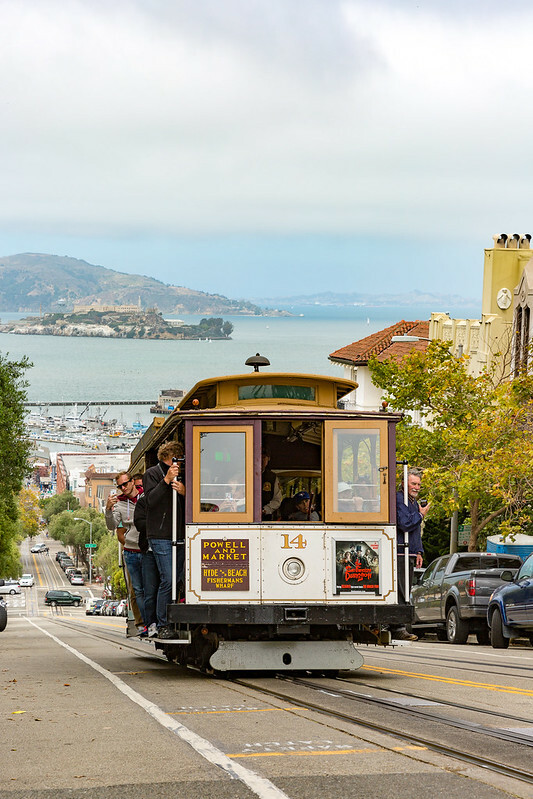 Two cable car lines run North-South from Powell St. at Market St. terminus to Fisherman's Wharf or to Ghirardelli Square; the third cable car line runs East-West on California Street between the Financial District and Van Ness Avenue. Pay for the cable car to the Conductor on board each cable car. The 'trolleys', which you get in underground stations along Market Street, are identified by route letters: J, K, L, M, N, T, each of which goes to a different section of the city away from downtown. 'SF Muni Metro' rides on bus or trolley are $2.75 per ride for adults or $1.25 for children 5-18 or for seniors 65+, and you can use transfers (ask for one when paying on your first bus) to get on a different route(s) to your destination; pay again for return direction. BART rail stations are at 4 selected locations underground along Market, and go east to Alameda County, or after selective surface station stops in SF continues south to the SF Airport. There is a Cable Car Museum you can visit. The Powell-Hyde and Powell-Mason lines stop at the Cable Car Museum, and the California Line stop at Mason Street is just three blocks south of the museum. But note that cable cars get very crowded mid-route and you may not be able to get a cable car ride back to your destination from that intermediate embarkation point. The walk from Union Square down Market Street to the Ferry Bldg. on Embarcadero is a very easy <1 mile walk. The F-line trolley runs along Market Street and then turns left and runs on the surface to Fisherman's Wharf. So you could walk down to the Ferry Bldg and then take the F the rest of the way to Fisherman's Wharf, or walk the 1.7 mi. from Ferry Bldg to Fisherman's Wharf. Fog may be an issue with these locations certain times of year. There are bunch of other spots that I missed when I was there, it really is a great photo city. Gotta get back there.